Around 300 staff were in the area when a torrent of sludge tore through the offices and cafeteria of a mine site in the state of Minas Gerais. At least 65 people have been confirmed dead, with many more workers still reported missing. The operation belongs to US mining firm Vale – the same company that is engaged in multiple multi-billion-dollar lawsuits over an eerily similar collapse at one of its Brazilian sites in 2015. The 2015 incident occurred at a tailings storage facility at the Samarco joint venture with BHP, causing 19 deaths and extensive environmental damage. 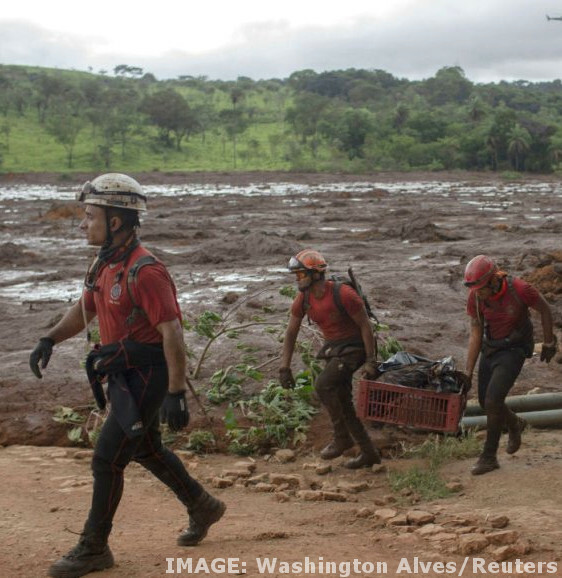 Authorities say the dam that burst on Friday at the Feijao iron mine was being decommissioned, and had about a fifth of the amount of toxic waste released by the 2015 Samarco dam break. The Feijao mine is one of four in Vale's Paraoeba complex, which includes two processing plants, and produced about 7 per cent of Vale's total output last year. Environmentalists say the spills reveal a deep lack of regulation. The deadly spill “is a sad consequence of the lessons not learned by the Brazilian government and the mining companies responsible for the tragedy with Samarco dam, in Mariana, also controlled by Vale”, Greenpeace said in a statement. “History repeats itself,” said Marina Silva, a former environmental minister. A UN report found that the waste from the 2015 disaster “contained high levels of toxic heavy metals”, raising fears of widespread contamination from the latest collapse.